A large sink and workspace, with running water present. The pivotal issue here, is that once your chemicals reach temperature, the process needs to be set in motion, and continue without being interrupted. The stabilizer, which actually treats the film to prevent bacterial damage. Unlike B&W film which contains Silver (a natural anti-bacterial…) color film is a tasty gelatinous treat for fungi and bacteria. As a result, omission of this step will cause rapid and premature degradation of your negatives. Fortunately (unless you are getting fancy with “pushing” the film and such…) there is little-to-no variability here with regard to film speed, manufacturer, timing, etc. It is basically “one size fits all!” NB: (there’s that phrase again…) Remember to save and reuse your chemicals!! The manufacturer claims you should get at least 8-10 rolls of 36 exp film out of each kit. At $20 for the kit, that isn’t too bad–less than two bucks a roll once equipment is purchased! Put all three chemical bottles in the sink. Open the developer. Wash off your thermometer and place it in the developer. Start the hot water running, and fill the sink to about six inches. The water should be hot enough to burn you. As hot as possible. It will take some time for everything to get up to temperature, and equilibrate. Watch your thermometer. When the temperature of the developer reaches approximately 101°F, you are going to want to start your water running slowly again, and try to find a point where the temperature of the water coming out of the tap is approximately 102°F. This water will be your pre-soak. When you are sure the tap water is about 102°F, place your thermometer back in your developer, and wait. 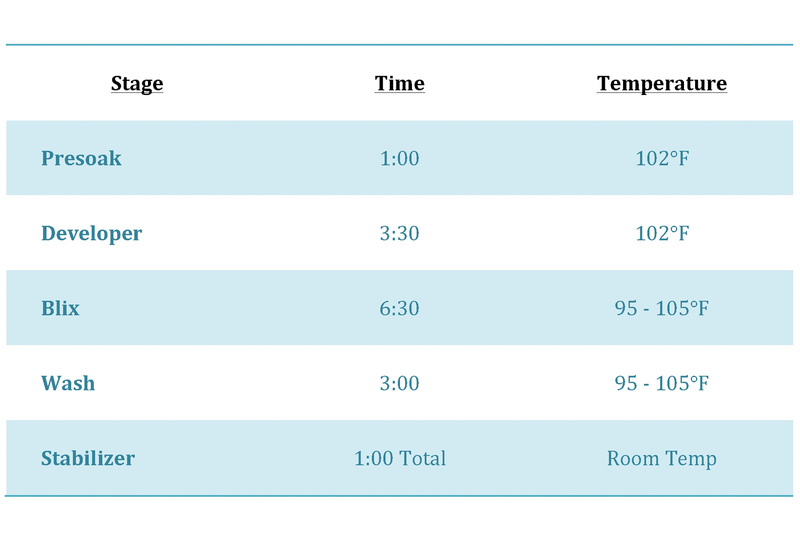 Take a deep breath…When your developer reaches slightly above 102°F (say, 102.3°F or so…) it is GO TIME. Fill your canister with running water from the tap. When the canister fills, start your timer and drain the sink, but keep the tap running! Don’t worry about the temperature of your Blix: it may drift down to ~95°F without any ill effects. The Stabilizer may even be at room temperature. Dump out the pre-soak, and pour in your developer. Reset the timer, and start it again. Agitate your canister for the first 30 seconds, and then for 10 seconds Every 30 seconds thereafter. Use SLOW agitations (one direction back/forth per second…) as aggressive agitation leads to more grain. When the timer hits 3:30, pour the developer back in the bottle with your funnel, and reset the timer. Evacuate the air out, and seal the developer bottle. Open the Blix, and pour it into the canister. Agitate for the first 30 seconds, and then for 15 seconds every minute thereafter. When the timer reads 6:30, pour the Blix back into the bottle. Reset your timer. Rinse the film with your warm, running water for the next 3:00 (Note: these next steps are not light-sensitive, and may actually be done with the lid off, and the canister funnel out). I use a combination of agitation, swishing, swirling, and pouring the water out. It does not matter what method you use, as long as you exchange the water in the canister frequently. When the timer hits 3:00, pour the last of the water out, and pour in your stabilizer. Agitate for the next 30 seconds, and then let the canister sit for an additional 30 seconds. Pour the stabilizer back into the bottle. In my experience, you still need a final surfactant and distilled water wash…especially as your chemicals age and become exhausted. (Some have advocated passing your chemicals through a coffee filter when returning them to the bottle; however, this is a messy hassle, and does not completely eliminate the problem of precipitates. I have successfully used good ‘ole Ilfotol (you only need about three mL…) with both distilled and tap water for the final wash, and it completely resolves the issue of crystalline deposition. Once you have treated the negatives with the stabilizer, return it to the bottle and take the funnel off of your developing tank. Pour in 3 mL of Ilfotol (or similar…Photoflo, etc). Then fill the tank with distilled (or “tap” if you’re “frugal”) water. Agitate for 15 seconds, then dump the solution down the drain. Gingerly remove your negatives and hang them to dry, with weighted clip at bottom. Below is a chart which should summarize the process…Feel free to print it out and keep it in your pocket. Hours later, scan your negatives, and send me a sample! Have another beer…and plan for the next roll! Looks like I’ll just be drinking beer! Which suits me…sold my M6 and consolidating my photographic focus just into the MM. Thanks for posting though Mark as may need this again one day….when the GAS returns :-). I’m not worried…you’ll be back! Excellent work Mark, I now consider you the film “man”. Honestly. Thanks Peter. I’ve never been “The Man” before! I am presently trying to ignore the siren song of a used MP…you are not helping. Next to an M3, the MP feels like a tin can (sorry, but it’s true). And even the most pristine M3 is a fraction of the cost. And, no doubt about it, you are the man. Wow…I had not heard that. And you would know: you’ve owned them all! I got this link from Peter’s blog and I love these instructions. I have not done film in forever. But I got the twinge, bought an M3 and I’m trying to decide on either Zeiss 50mm f2 or Voigtlander Nokton 40mm to start with it. I had done my own B&W negatives right after fire and before electricity but I love color equally so this is awesome. I can’t believe those ponces over at Nikon quit making their film scanners because they thought it would hurt their durn useless dslr biz. OK already, film is almost dead, give us the durn scanners back for crying out loud. Between you and Peter I am totally pysched to get this film thing going again. So glad to hear it! And welcome back! If I may, the Plustek 7600i is a low-cost and reliable option for low-volume scanning (Peter put me on to it…) and the software you are going to want to purchase is VueScan. Feel free to contact me with any questions. All the best…and good luck on your odyssey! If you only ever shoot T-Max black and white film, then all you need is a developing tank, water, baking soda, and …I kid you not.. instant coffee. Having the pool chemical named Sodium Thiosulfate wouldn’t hurt either. What you do is mix equal parts of coffee and baking soda in warm water so that there is a healthy amount of ‘coffee developer’ in the water…load the film into the developing tank, pour in the ‘coffee developer’ and agitate every 45 seconds for 45 minutes (listen to a music album that was originally on a vinyl record to help pass the time). Then you dump out the ‘coffee developer’ and take out the film in dim visible lighting and rinse it under plain water. You should see visible reflective images on the emulsion side of the film. If you want to make the image projectable you will need to soak this film in water mixed with sodium thiosulfate. It can take 20 more minutes for the film to become transparent with the opaque part being the recorded image. Then rinse again and you can ow gawk at the negatives under a compact fluorescent flashlight. Film developing at home is the Best Part Of Waking Up. I have heard of “Caffenol” before, but this is even simpler than that! Is it just Tmax that this works for, or other B&W films as well? I may take you up on that question thing. It was so kind of you to offer. I have been reading every intrawebby review and comparison on scanners below $600 using your recommendation as the starting point. Die damn Deutschen of course had to bad mouth it a little but I am kind of discounting that a little bit because every review on their site favors, shocker, German model over everything else in the price class. I had read just enough before seeing your advice to know VueScan seems to be the way to go. I am SO excited. My birthday was last week and I combined every check I was fortunate enough to get and sent them to BH. My Voigtlander Nokton classic 40 was on my doorstop yesterday. I only had some expired AGFAPAN APX 100 in the fridge so in it went. But I will be anxious to put some color in next also and try your instructions for the first time. I had done B&W developing decades back, but never had the cojones to fiddle with color but you have inspired me. Now if I could only stop reading web reviews and choose a durn scanner. For small jobs, you really can’t beat the Plustek 7600i. The color rendition is accurate, and it is small and quick. It is great bang for the buck. If I had problems with a scan on my V600, I would feed it through the Plustek and usually resolve any issues. The Epson V600 allows you to do batch scanning, which is slightly more convenient (albeit a little finicky…especially with color balance). It can presently be had for as low as $230 CAD. In actual fact, I have purchased a V700 in addition (firewire…faster) so am looking to sell my (basically new…) V600. You are welcome to it for $100, but you’ll have to pay shipping…which will be pricey! Anyway, good luck with the first roll!! I sold the Plustek and bought instead a beaten Konica Minolta Dimage 5400… what a difference it made on the diapositive scanning!! With the Nikon Coolscans, this Konica is the best film scanner you can acquire on a consumer level. The Konica is difficult to find even on fleaBay, and also in good condition… But the difference it will make to your scanning, same with Coolscans, will be dramatic IMHO. Thanks Manuel, for this important info. Nice over view – and timely too. I just bust open a new C-41 kit this evening and have 2 rolls drying in the shower at the moment. I don’t have much C-41 experience (mostly B&W), but I did want to point out one potential problem in your guide – the stabiliser should be the last step before hanging the film to dry. The purpose of the stabiliser is to prevent the negatives from deteriorating over time – including mould! 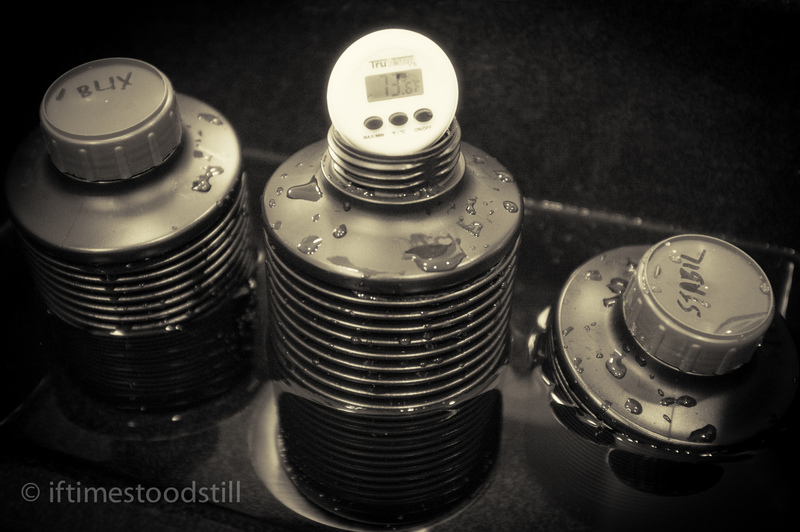 Rinsing with water after the stabiliser will, well, destabilise your negatives. As far as I know, it’s safe to run the film though the stabiliser a second time to preserve them again. Just thought you should know! Thanks for your comments. You are certainly correct in your information; however my reading on the subject has led me to the conclusion that a quick rinse in Fotoflo (or similar surfactant) will not mitigate or reverse the effects of the stabilizer. Once it has had a chance to bond with the film emulsion, its effects seem to be permanent. In truth, however, what I need is a good SCAN–once the digital negatives are archived, the film negatives are boxed and filed anyway; as a result, I would rather have a nice residue-free emulsion than one that is going to outlive me! Can’t wait to hear about your results! All the best to you–and Happy New Year!